Whilst I may be avoiding Easter eggs, having the extra time to spare in the mornings over the bank holidays means I can spend a little bit longer making a delicious and low smart point breakfast. This one is one of my favs. Anyone I’ve every served this too has loved it and never guesses its a healthy option. 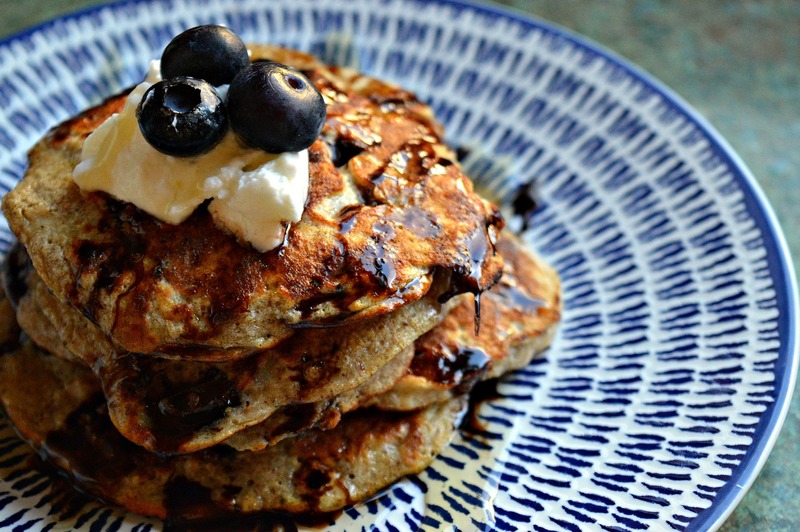 You get a giant, sweet and satisfying pile of pancakes without any of the guilt. This one is the perfect Easter brekkie and it really doesn’t take long to make at all! In a large bowl mix together the mashed banana, beaten eggs and cinnamon. Using a ladle, drop a sixth of the mixture into one corner of the pan. The pancake should be around the size of a large mug and quite thin. Press four of five blueberry halves into the pancake. Repeat so you have three pancakes on the go at once. Serve with a tsp of yoghurt, a sprinkle of cinnamon, a few blueberries and a drizzle of honey or choc shot. I tried these for breakfast this morning & my 6 year old son had scoffed his portion before I’d finished serving up mine! Just to let you know on the desserts page this is displayed as beef curry! I LOVE your turquoise necklace, do you mind sharing where’s it from? I made these tonight. I don’t have a sweet tooth but these were fabulous. Thank you for sharing.